The Singapore Armed Forces has been going through a transformation in to a state of the art in all of its three branches. The Army has seen the purchase of new equipment, which has either been purchased from outside of the country, such as the Leopard 2A4 MBT or developed its own vehicles such as the Bionix IFV series, which are all intended to fulfil the roles of the 50yr old M113’s and AMX-13’s. This transformation has made the Army the most advanced and capable in regards to land and amphibious operations in the region and a keen player in the Five Power Defence Arrangements. The Bionix IFV was set as an operational requirement by the Singapore Armed Forces to AFV manufacturer Singapore Technologies Kinetics, following their inability to find an existing IFV (ie the Bradley) that met their requirements. SPK developed some prototypes and first production vehicles were completed in 1997. Since then, other models have been built and also in service with the Army. The two man turret (Commander on left & Gunner on the right) is located in the middle of the hull. An electrically stabilised ATK M242 Bushmasters 25mm chain gun is mounted in the turret with a coaxial 7.62mm MG, giving the vehicle a fire on the move capability. The turret is also electrically traversed a full 360 degree’s. The main gun has 180 ready-to-fire rounds plus 420 rounds in the ammunition store. The cannon fires HEI and APFSDS rounds, which are dual-feed, allowing the gunner to swap with a flick of a switch between both types of rounds. A 7.62mm MG is mounted on the turret roof for of the turret giving the vehicle an Anti-Aircraft capability. The gunner has a day/thermal sight with a x8 magnification. Both commander and gunner can lay and fire the 25mm & 7.62mm. Commander has 5 periscopes, gunner 3 periscopes. The vehicle is constructed of steel and uses modular armour in a spaced armour format. It’s equipped with a bank of 3 smoke grenade launchers either side of the turret. It has no NBC protection system. The rear compartment can accommodate 7 fully equipped troops. They have access to a single roof hatch and exit via a powered ramp in the rear. The Driver is sits in the front left of the vehicle, with the engine to his right. The engine is a Detroit Diesel Model 6V-92TA, which generates 475hp giving the vehicle a top road speed of 70km/d and operational range of 415km. It uses an automatic gearbox and hydrogas suspension. Its believed that 300 of the production vehicle have been built. This vehicle has a smaller open top one man turret, which reduces the crew too 2, freeing up more space in the hull so that 9 fully equipped troops can be carried, rather than the original 7. The new one man turret is the Chartered Industries of Singapore (CIS) 40/50Cupola Weapon Station with powered traverse and elevation. This is armed with the CIS 40mm 40 AGL (Automatic Grenade Launcher) and CIS12.7mm 50 MG (Machine Gun). This turret has been used on the SAF’s upgraded M113 APC’s. 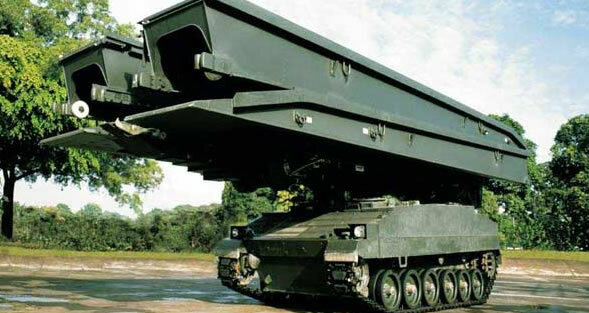 variant fitted with an MLC30 bridge that can be launched within 7 minutes by a crew of two (commander and driver) from the internal armoured compartment or via remote control panel. When extended the bridge can be used to span a gap of up to 22 metres. Like all series of armoured fighting vehicle, it needs an equally powered vehicle to help it and rescue it if its been damaged through combat or got its self stuck in an obstacle. 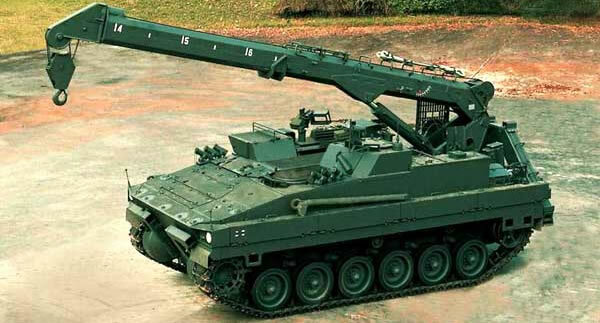 The Bionix ARV has a 25ton pulling winch (Bionix combat weight is 23tons) and a crane which can lift 30ton. The Defence Science and Technology Agency (DSTA) and Singapore Technologies Engineering worked together on the development of increased firepower and Situational Awareness for the Bionix 25 IFV. The original 25mm has been replaced with a ATK Mk44 Bushmaster 30mm. It’s also dual feed and gives the vehicle a 50% increase in armour penetration. It has an improved thermal sighting system with a new stabilization, which increases its ability to target track with a new integrated eye-safe laser rangefinder. The turret has been equipped with a new modular armour system. It has a new networking Battlefield Management System, which features a vehicle navigation system, Blue-Force Tracking (SAF) and Red Force Marking systems (enemy), as well as extensive communications equipment to network with other air and land-based SAF platforms. The vehicle entered service with the Singapore Armed Forces in 2006. The vehicle has not been exported to other nations.